De facto Nokia is the main manufacturer of devices based on 60 platform (Symbian smartphones). The functionality of the models is the same because of the platform limitations but the number and quality of the functions is a great advantage. When having a platform one doesn't need to invent a bicycle every time that's enough to do it once and then use in any device. But the unification of the platform also has its hidden dangers. That's enough to make a mistake once and the products will be accepted cool. Changing a platform quickly is impossible, working out a platform takes much more time than manufacturing a phone. Nokia 6630 is very interesting in this aspect, it is the first based on a completely new platform. If having a look at the specifications you won't find any principal differences from 7610/6670. A similar form-factor, more functions (the camera is better, software renewals, new operating system) but not a single hint at the fact the device is completely renewed as compared to the previous models by the company. If having a fluent look at Nokia 6630 no any doubts the device is similar to the others appear. I'm sincerely grateful to those forum users that drew attention to the diversity of Nokia 6630 and other phones and made us commit researches in the field. I'll note that the acquaintance with Charlie happened long ago and in quite a confusing manner. The first delivered device didn't turn on at all and the received instructions told to run the last version of Phoenix, so it took some more time to receive it. The experience in revitalizing the dead one was not a successful one and the smartphone refused working. On the release of the 3 hardware version the device could have been turned on and worked acceptably. The announced camera similar to the one used in Nokia 7610 was absent there. The first impression of the phone was gained, the cover letters were read and the device got on the shelf. That happens with the devices that are not of any interest and our phone seemed a version of already existing ones. And that's why I'd like to thank once again those who tried to reveal the differences in their posts. The search of the documents didn't provide any information on which platform is used in Nokia 6630 only heaps of marketing garbage and some interesting presentations describing actual changes but not a platform. The affair went better when a BB generation name appeared in one of the documents, BB stands for BaseBand. The phone is not a DCT-4 device and it's a technically new platform. We won't describe any hardware changes and those who wishes may find two presentations in the company's intranet though that'll take some effort. I'd like to remind our readers that to prolong the life circle and widen the capabilities of the model the company has released several editions or if you want versions of the same platform (here we mean the software and in BB case these are hardware changes). 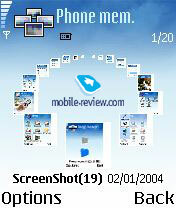 These software renewals were named Editions and for instance, Nokia 6630 is a device based on Series 60 Second Edition. Nokia 7610/6670 are based on the same platform. That would seem a mistake if we speak about new platforms and the devices belong to the same edition. In fact everything is explained with the fact that starting from the second edition various software and hardware add-ons called Feature Packs appear. There are only three of them for the third edition - Feature Pack 1, 2 and 3. The add-ons are mostly intended for software developers but also they bring some new opportunities for users. The first models with Feature Pack 1 installed are Nokia 6620, 7610, 6260. 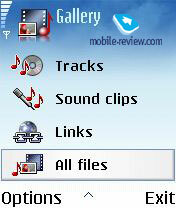 And Nokia 6630 is the first with Feature Pack 2. One should understand that all the announced for Feature Pack features may be not implemented in a single device. The realization is a private affair of the manufacturer, its positioning of the device and giving this or that functionality to the device. 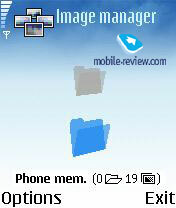 For example, Nokia 6620 doesn't have a megapixel camera though Feature Pack 1 has a support for such hardware. The main change concerns the version of the Operating System, this is 8.0a version in the 2 pack. The support for a cheap NAND memory is included into it and it's up to an owner whether to use it or not. Expansion of standard APIs, in particular, that is adding interfaces for creating voice recognition applications, 3D applications, wider possibilities for working with sounds and coding streaming data. The 8 version also brings new ways of interface design, the windows may be transparent. WCDMA. This is the main and the most significant change in the second pack. Any smartphone supporting UMTS will be based on the second pack or its later version. At the same time Series 60 Feature Pack 2 may be applied in some products but the device won't support 3G networks. Circuit Switch ( CS ) Video Call – a function responsible for video calls, everything is rather clear. Active connections monitor – applications may get info about what connections are active at the moment. Uploading files to a server – a possibility to send files from the phone to a remote server. Number, e-mail address, links backlighting in SMS, MMS. Having chosen a backlighted item you'll be able to save it or make other actions. 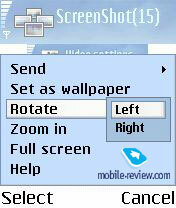 Such realization may be found in Sony Ericsson P900 or ther smartphones by Sony Ericsson. Automatic monitoring of e-mail messages. There is a possibility to set time intervals for checking your mail box. The way of uploading a message is chosen in settings menu, a message may be uploaded as a header or partially (up to an indicated number of KB). Expanded gallery. The application is renewed completely, files of all the types may be viewed in a single list, mp3 files may be sorted automatically depending on the name of the file (taken from an ID3 tag). RealOne Player – reproducing not even in a small window but full screen. The camera allows multishooting. Up to 6 pictures at the time. Photos are kept in an EXIF format that is also used in usual digital cameras. Full support for DRM, now pictures with the rights of third companies are impossible to transmit to other devices, they may be used only in the device they were received or preinstalled on. Basic Imaging Profile – allows the devices supporting the profile changing the size of a picture before sending it via bluetooth and thus a high compatibility with the devices of another screen resolution is achieved. Java – a support for calendar data from various applications, 3D graphics and a number of other improvements. 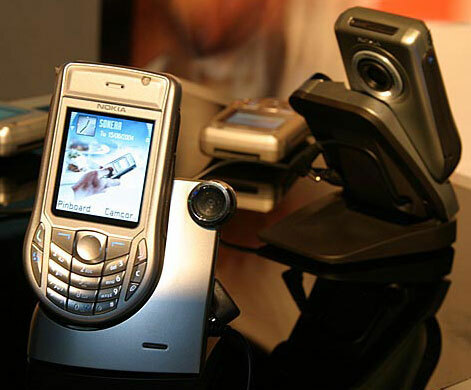 Nokia 6630 is a today leader of the company's product line. The design is comparatively unusual, thus on the bottom end we see small ovals resembling similar ones in younger models (Nokia 3650/3660). That's curious that the device changes much with a red interchangeable panel and resembles Nokia 3660 much, I doubt this comparison is to its good. In any case the device is usually delivered in two calm colour solutions and in particular they are Aluminium Grey, Light Green. Interchangeable panels do not make the device weak, no any cavils to the quality of the body. The phone doesn't creak in hands and assembling is excellent. The manufacturer intends selling up to 4 extra panels (red, green, blue and cream). Interchangeable panel have become usual for fashion phones but in business phones (actually in smartphones) they appeared not so long ago. The dimensions of the phone are typical for the class (110x60x20.6 mm) but taking into considerations the support for WCDMA the device is smaller than similar ones. The weight of the phone is 127 grams and that's comfortable for wearing the devices as you like. The screen doesn't differ from ones in other Nokia smartphones in physical parameters (65K, TFT). The resolution is 176x208 pixels (35x41 mm) and the screen shows up to 8 text and one service line. In general the screen is comparable with ones in similar phones, that's not bad. The picture looks vivid, the colours are not very bright, a bit dim. Considering that the interface is drawn according to the capabilities of the phone no any feeling of a lack of brightness or contrast of the picture appears. The screen is not bad for this segment but should not be compared with the screens of usual phones, that would be incorrect. It fades in the sun but in the majority of cases information may be read. And now let's give free play to a subjective factor. Comparing the quality of the screen with previous models we may say the settings are better here, the picture is more vivid, bright and clear. The difference is not principal but it exists. The screen looks better. The fact may be explained mostly with new power supply capabilities, providing the same time of working in the standby mode the screen shows a better picture. A white transparent circle may be seen above the screen. That's a light indicator. Depending on the illumination level keypad backlighting either works or not. The keypad is very pleasant despite an unusual appearance, it especially concerns a navi joystick that is capable of processing pressures as well. The key backlighting is white. There's a loudspeaker gap on the top of the phone. The sound is heard well thanks to the new construction. On the left-side surface there is a button activating a voice dialing function, loudspeaker may be activated with its help during a conversation. There is a charger connector closer to a bottom end, just on the curve and a standard Pop-Port on the rare bottom. There is an On button on the right-side surface, it's also responsible for changing profiles and turn on of the phone lock. There is a RS-MMC connector closed with a folding cover a bit lower. The cover adjoins the body closely and may be hocked with a nail. In fact the model is the first Nokia phone with a hot memory card change realized. Hot changing in Nokia 6260 may not be considered well realized because there is a need for taking off a cover of the battery module. DualVoltage RS-MMC cards are used here to prolong battery life. And if the cards we are used to work with a voltage of 3W then cards in Nokia 6630 with 1.8W. A card of 64 MB is included into a delivery package and changing the card for some more capacious will be hard in the nearset future. 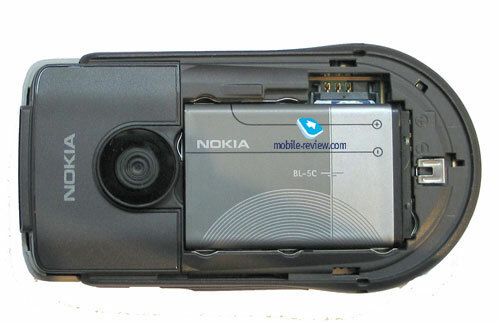 Third party manufacturers do not produce DV RS-MMC cards and Nokia offers only 64 Mb ones. That's not enough for today and some improvements may be expected only in the first quarter of the next year, third party cards will appear in March or a bit later. That's curious that we didn't manage to find even 64 Mb cards by Nokia in retail networks and evidently due to the absence of the phone they are not demanded much. Fortunately, we had a prototype of another manufacturer's phone at our disposal that was supplied with a 256 MB DV RS-MMC card. The phone can see the card and works well with it. We'll note the card used had some limitations and was not a commercial product. That's why the only conclusion may be done that the phone is capable of working with such cards and no any problems will appear in future, the main thing is that more capacious cards should appear. A megapixel camera may be seen on the back panel. There are no any protecting lenses (just a hole in the back panel). The objective lens is closed with a projecting part of the device and we may think it won't get dirty too soon when treated carefully. A plastic rim is not fixed well and moves when pressed with an effort. There are 10 MB of integrated memory and that's not enough, the manufacturer considered the user would permanently use a changeable memory card. In some kind that crosses over the whole idea of a changeable card, you won't make reserve copies of all the programs on every memory card. Experience of Sony Ericsson concerning the problem is very interesting, the company equipped its first two models (Р800, Р900) with a small capacity of internal memory considering that those who need more would get satisfied with an extra card. But in Р910 we see the internal memory increased in size much. 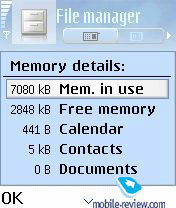 Even an ordinary user will fill the whole 10 MB of internal memory quickly because there are very many programs for today. It's up to you whether to consider it a drawback or not, that's clear that the decrease of memory capacity makes the price lower. The phone is equipped with a Li-Ion 900mAh battery. According to the manufacturer it provides from 2 to 6 hours of talk time and from 135 to 250 hours of standby time. In Moscow the device worked about 2-2.5 days in case of 40 minutes of talk time and up to an hour of using other functions. We may say that using the device fully is possible within two days. The time is much longer as against the background of previous model. It increased for 15-20 per cents. I'd like to point out the fact that the device works not much sorter with a permanently active bluetooth, about 15 per cents only. This is a good result and it was worse earlier. Full charging takes about 2 hours. According to a SPMark 04 test the battery got 2828 points, working time was about 6 hours 32 minutes and the test worked about 155 times (a cyclic implementation of all the tests). Just to compare Nokia 7610 has a bit less point, but 112 cycles of test is about 12 hours of working in case of this device. The difference in working time seem to be not in favour of Nokia 6630 but it's not so. The phone makes more tasks in a unit of time and standby time is comparable. And finally a good news for those who like using an mp3 player, a support for stereo is added, listening music via a headset you get stereo sound. The architecture of the phone is changed extremely, the smartphone has a higher productivity with a bit increased working time. Let's start with a plain test and that is JBenchmark 2.0.2. 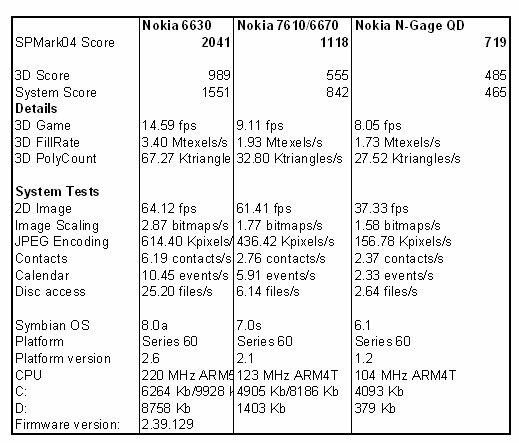 We see that in some tests Nokia 6630 has double or triple advantage. That is mostly thanks to a faster processor, here it has a 220 MHz operating speed (ARM 5). For comparison, in Nokia 7610 operating speed of an ARM4T processor is only 123 MHz. Widening of system memory area plays it role here. disk D has 8758 KB against 1403 in Nokia 7610. Let's look at the results of SPMark04 test, they'll tell about the device in details. Almost all the results are higher than for the previous model. Only work with 2D images is comparable. The result is easy to interprit, both software and hardware parts tell upon the productivity. The device rouses no any cavils concerning the quality of voice transmission. It works well. Signal volume was increased, standard melodies are plain but when setting an mp3 file up to your taste volume level gets maximum. Vibrating alert is average in its power. Despite some eclecticism and not strict forms the comfort of using the phone is high and such a feeling appears that all the users' cavils were taken into account. The screen got better, hot change of memory cards appeared but the internal memory size is not great. This smartphone is one of the best in the market for the moment. It has almost no any rivals in its class. Taking into consideration the presence of a very qualitative camera also the best in its class it's possible to say the model is worked well. The phone as no evident rivals for the moment. Just think yourself that is the fastest device with maximum capabilities. The absence of the second camera for vide calls is explained with two reasons. First, there are not so many 3G phones now and a camera even increases their price. Second, those who really want to use the possibility make most of the calls from their offices or homes and that's why a special accessory (a camera with a holder) was represented. The absence of the second camera may not be considered a disadvantage, that is a niche function for the moment. In the middle of the next year a renewed Nokia 6630 will appear and it'll be equipped with the second camera and more memory. 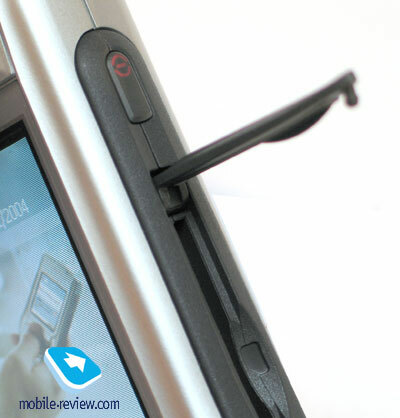 The final conclusion about Nokia 6630 is that it's the best smartphone without a touchscreen. Its absence brings some limitations to the phone but Nokia 6630 has no any real alternatives in its class and they won't appear in the nearest future. The price for Nokia 6630 will be about $650 when the sales start. And in a month it'll get about $600-$610. The difference of about $100 will always be kept between the model and Nokia 6670, so we shouldn't expect Nokia 6630 to get cheap soon. The product is the leader and it'll have a long life cycle. The device will be comparable with Nokia 7650 in its life time. In general a real choice of smarthones for one's needs appeared in the market. If you need a touchscreen and similar functions you mat buy a more expensive Sony Ericsson P910. If data input and easier navigation are not principle and the device is used for viewing data, seldom editing, the data is loaded from a PC then Nokia 6630 is the best. 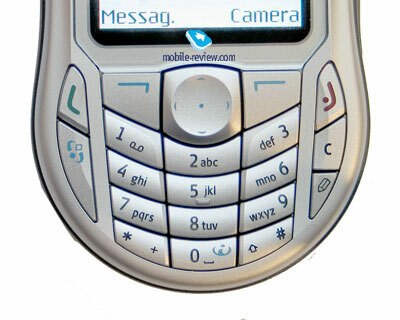 Nokia 6630 is a real success of the company for several years, it joins innovations and style. I advise to pay attention to the model. SAR level for the device is 0.83 W/k. I advise to wait with buying Nokia 6630 till the next year, for example, till the end of January. There are several reasons. The first and the main one is that the device though working stable has some software mistakes for the moment. The second reason is not so evident, hardware part will be changed a bit and thus renewing the software later won't be so smooth for the device.